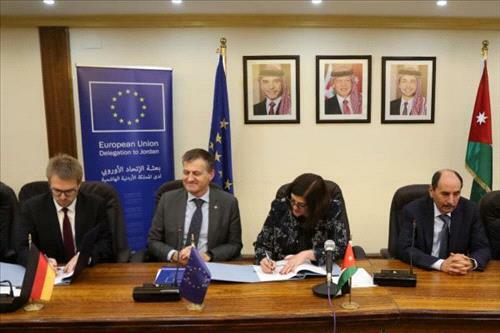 AMMONNEWS - The government and the German Bank for Reconstruction ( KfW) signed an agreement on Wednesday to implement an additional grant of €30.6 million provided from the European Union (EU) to build new schools across the Kingdom. Minister of Planning and International Cooperation, Mary Kawar, and the bank's director in Jordan, Christian Chaub, signed the agreement. During the signing ceremony, the minister said the agreement aims to build 10 new government schools, and equip their labs with the EU's support through the EU's credit fund to respond to the repercussions of the Syrian crisis. Kawar stressed the importance of the project in reducing pressure on public schools, which receive large numbers beyond their capacity as a result of enrolling thousands of Syrian students in government schools across the Kingdom. The minister noted the agreement comes within the framework of efforts to follow up the implementation of financial commitments announced by the donor community during the conference held in London recently, expressing the Jordanian government's gratitude to the EU for the continued support to the Kingdom and for the KfW for its partnership with Jordan in this key project. She said relations with the EU are based on a solid foundation of shared values, mutual respect and cooperation, and the continuous efforts of the two sides to strengthen their partnership in various fields of common concern, especially in view of the EU's understanding of the challenges facing Jordan, especially during this difficult period it is facing due to repercussions of regional crises , including the hosting of Syrian refugees. For his part, Minister of Public Works and Housing Falah Al Amoush thanked the European Union for this grant, which came to support the building of schools, increase their efficiency and improve the quality of education, especially at schools affected by the Syrian refugee crisis. The German Bank for Reconstruction will implement the grant with the government through the project agreement prepared for this purpose.